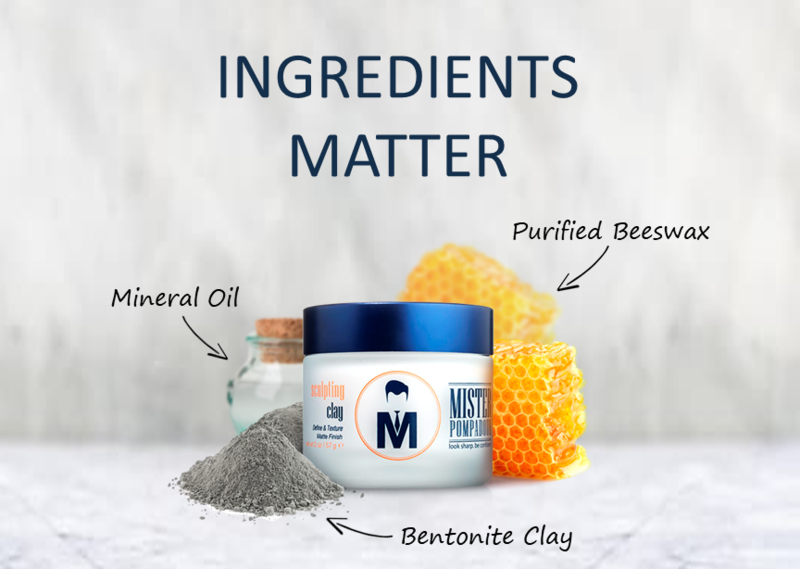 A lightweight styling clay that contains bentonite clay and purified beeswax to provide medium hold and a matte finish. Ideal for hair that requires volume and definition without worrying about product weighing it down (particularly finer hair types). Its smooth and creamy texture makes it easy to apply in short to long hair and can be used for combed or messy hairstyles. The clay will make hair feel fuller by adding extra body and thickness. Apply to towel-dry or dry hair for best results. But I think I prefer the natural beeswax better than the sculpting clay. Great working with Matt on this order. I've been using the sculpting clay for YEARS, and it's the ONLY thing I'll put in my hair to get the perfect rise, matte, hold, and natural feel. I have thin hair that can be frizzy at times, but the sculpting clay brings a normal texture to my hair and allows me to style it with ease and great a finished and polished look everyday! Fantastic products. Love the sculpting clay, has great hold and maintains shape throughout the day. Add on a little texture paste to get that extra bit of style. Couldn’t be happier with all their products and clients of mine love them as well! Great product! So far it works great on my frizzy curly hair. How do I apply the Sculpting Clay? Scoop a nickel-sized amount and spread through your palms or fingertips. Apply evenly starting at the crown and working towards the front. Use a blow dryer, either before or after applying product, to give extra volume, body, thickness and stability. Apply more if needed. Can it be used as a pre-styler? Yes, Sculpting Clay can be used a pre-styler in conjunction with another styling product. As a pre-styler, it is recommended to add the Sculpting Clay to towel-dry hair and proceed to blow dry the hair into its initial shape and to get volume. Then finish the overall styling with something like Natural Beeswax Paste for higher hold. It provides a matte finish that's not greasy looking and it won't leave sticky residue or flakes in your hair. It features a light lotion scent that’s not overpowering and won’t interfere with your cologne. Water/Aqua/Eau, VP/VA Copolymer, Mineral Oil/Paraffinum Liquidum, Beeswax/Cera Alba, PEG-40 Hydrogenated Castor Oil, Bentonite, Cetyl Alcohol, Glyceryl Stearate, PEG-100 Stearate, PEG-7 Phenoxyethanol, Caprylyl Glycol, Ethylhexylglycerin, Hexylene Glycool, Methylisothiazolinone, Limonene, Linalool, Citronellol, Butylphenyl Methylpropional, Hydroxyisohexyl 3-Cyclohexene Carboxaldehyde, Alpha-Isomethyl Ionone, Hydroxycitronellal.